A sinus x-ray is taken in a hospital radiology department. Or the x-ray may be taken in the health care provider's office. You are asked to sit in a chair so that any fluid in the sinuses can be seen in the x-ray images. The technologist may place your head in different positions as the images are taken. Tell the doctor or x-ray technologist if you are or think you are pregnant. You will be asked to remove all jewelry. You may be asked to change into a gown. There is little or no discomfort with a sinus x-ray. 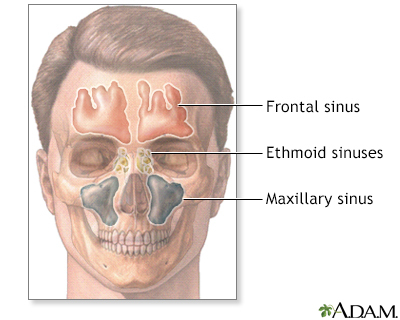 The sinuses are located behind the forehead, nasal bones, cheeks, and eyes. When the sinus openings become blocked or too much mucus builds up, bacteria and other germs can grow. This can lead to an infection and inflammation of the sinuses called sinusitis. These days, a sinus x-ray is not often ordered. This is because a CT scan of the sinuses shows more detail. The x-ray may detect an infection, blockages, bleeding or tumors. There is low radiation exposure. X-rays are monitored and regulated so that the lowest amount of radiation is used to produce the image. Beale T, Brown J, Rout J. ENT, neck, and dental radiology. In: Adam A, Dixon AK, Gillard JH, Schaefer-Prokop CM, eds. Grainger & Allison's Diagnostic Radiology: A Textbook of Medical Imaging. 6th ed. Philadelphia, PA: Elsevier Churchill Livingstone; 2015:chap 67. Chernecky CC, Berger BJ. Sinus radiography - diagnostic. In: Chernecky CC, Berger BJ, eds. Laboratory Tests and Diagnostic Procedures. 6th ed. St Louis, MO: Elsevier Saunders; 2013:1020-1021.